Gluten free eating in restaurants. How to pick the right restaurant and meals! 30 Complete Chapters - Everything you need to know about gluten free diets including gluten intolerance symptoms, facts, myths, danger signs and other gluten free secrets. Amazing Recipes - Delicious gluten free alternatives to your favorite foods including yummy gluten free recipes bursting with flavor that take just minutes to cook. Healthy Lifestyle - Ways to eat out in public places with your own list of things to avoid in restaurants and while travelling - Plus strategies to minimize pain and cramps if you accidentally eat gluten... and much more! Looking for a way to eat out gluten free in restaurants? If you have been diagnosed with gluten intolerance, you may often find it difficult to eat out in restaurants. However, it is important to note that if you are the type that likes eating out, there is no reason that you should not do this simply because you have been diagnosed with gluten intolerance. Indeed, it is possible for people with gluten intolerance to eat in restaurants although they will be required to be extra vigilant as they do this. Look out for restaurants that have waiters and chefs that will be willing to help you out. This is because you will need to find out how different menu items are prepared. Indeed, a good understanding of the different terminologies used in different restaurants will also be quite helpful. Avoid starting out hungry because the hungrier you are, the higher the chances that you will make a mistake and probably feed on something that you ought to have avoided. In fact, if for some reason you realize that you are very hungry, it may be safer for you to carry some crackers which you can munch on as you wait for your meal to be ready. Familiarity with what a gluten free diet entails is also very important. This basically means that you need to be aware of the kind of grains to avoid in addition to protecting yourself against any form of cross contamination. Point out to the staff present in the restaurant that preparation of any food that will be served to you has to be done on a clean cooking surface. This is the only way to avoid cross contamination and if you do not take time to remind the restaurant staff about this, they may easily overlook this fact. Be very careful as you choose your restaurant. You need to know that there are very many restaurants that are friendly to people with gluten intolerance. However, you need to find out from directories where such restaurants are located as well as the kind of menu items that they offer. It may turn out to be very frustrating if you start hopping from one restaurant to another trying to find one that offers a gluten free diet. Indeed, you may even call a restaurant in advance and speak to the chef so that you are sure it is the right place for you to visit. Always make a point of informing the restaurant staff that you are on special diet. If you realize that the server is not being of much help to you, you may ask to speak to the chef. Indeed, you may even carry a dining card with you so that you can easily explain to the chef what you are allowed to eat and what you are not allowed to eat. The number one rule for any person on a gluten free diet as he/she goes out to eat in a restaurant is to be extra vigilant. Also, you should never make the assumption that any dish is gluten free unless you have confirmed that with the chef. If you eat a dish in a restaurant then experience gluten intolerance symptoms, you can reduce the pains and cramps that come by using a handy little tip I've included in my book. It's really effective for reducing the awful pains that come when you accidentally eat gluten. You can print out the card below for your purse or wallet, then simply hand this to the staff or chef at any restaurant so that they understand which foods you are able to eat. This avoids confusion and is often easier than trying to explain severything to your waiter that may not be communicated to the chef. Want to know more about gluten free restuarants? I've written a complete handbook that covers this topic and many others, it's everything you need to know about gluten intolerance and the simple steps to follow for a happy gluten free lifestyle. If you purchase today you will receive 6 bonus items, including free updates plus a personal service where you can request diet planning and any custom recipe you crave in a gluten free version. Everything you need to know about gluten free diets and how to live a healthy gluten free lifestyle. You still get to eat what you want, with none of the pains & cramps. Uncover secrets to a gluten free life in 6 easy steps. A complete guide to feeling fresh and looking younger by using a range of techniques you can use yourself in the comfort of your home. Don't you just love being pampered and looking great? That's right, every time my book is revised and updated you will receive the new information absolutely free. This means you can keep informed of the latest gluten free diet news and updated lifestyle plans. If you are suffering from physical and psychological complaints, shiatsu massage therapy can bring improved overall health and an uplifted spiritual condition. Who doesn't love a deep, relaxing massage when feeling sore or stressed? If you have a specific question or need special gluten free recipes or gluten free diet plan created, contact me and I will tailor a solution to your own personal needs. You have the confidence in knowing you have someone to help with your own personal requirements. Using our visualization and affirmatives, we can move toward a positive future while developing the inner self. Would you like to improve your life and enhance your personality to enrich experiences? If you have read this far in the letter, you are seriously interested in improving your life and eliminating all the physical and emotional problems that come hand in hand with gluten intolerance. "Your billing statement will show a charge from Clk*Bank.com." 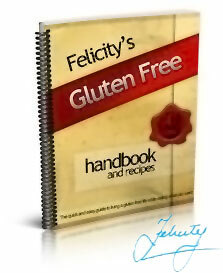 Simply click on the BUY NOW button to securely order Felicity's Gluten Free Diet Handbook right away and change your life for the better, you will receive your handbook instantly! instant refund with no questions asked. I know it will improve your life!